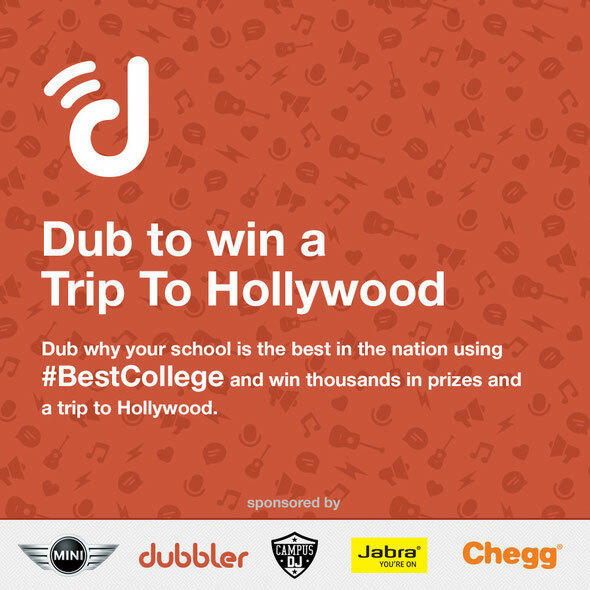 Campus DJ and its partners are inviting students across the USA to share why their school is the #BestCollege through Dubbler for a chance to win an all-expenses paid trip to Hollywood for two for the Campus DJ National Finale at Avalon on June 20th, featuring a special surprise guest DJ, plus a $3,000 prize pack courtesy of Jabra, Dubbler, MINI USA, Chegg, and the Monster Energy Outbreak College Tour. The most creative Dub will be chosen on June 10th by Campus DJ's co-hosts, Flula Borg and DJ Mick (formerly Mick Boogie), and announced on June 12th. The winner will receive an all-expenses paid trip to Hollywood for two for the Campus DJ National Finale crowning the nation's top College DJ, and a prize pack including a pair of Jabra Revo headphones enhanced by Dolby Digital Plus and Jabra Solemate portable Bluetooth speakers, gear from Monster Energy, $500 off a new MINI or MINI NEXT Certified Pre-owned MINI, a custom Dubbler filter created in the winning school's honour, and more. You can check out all of the #BestCollege Dubs at bestcollege.dubbler.com. Hi my friend! I want to say that this article is amazing, nice written and come with almost all vital infos. I'd like to peer more posts like this .